Reservere the date for the 15th anniversary: Oct 25 – 27, 2019! More information will follow. We are looking forward to welcoming you to the 14th Munich Balboa and Shag Weekend from October 26th - 28th, 2018! Amazing live music will be provided by the fantastic Doc Scanlon’s International All Stars with musicians from six different countries at the party on Saturday evening. Hotel Wallis is again offering special reduced rates for all MBSW participants. The hotel is literally around the corner. We are looking forward to welcoming you in Munich and wish you an unforgettable weekend with a lot of dancing and many new friends. It is still possible to register for the workshops at the Check-in if the Leader / Follower balance permits. For the parties a limited number of tickets are available at the door. You can also sign up for the newsletter to be automatically informed about all important things. There are about 15 tickets for the Friday party as off Oct. 24th! The Saturday party is sold out! On Sunday morning we will offer a Swing Breakfast for the first time. Get a perfect start into the day with Doc Scanlon's International All Stars, good food and dances. There will be a special open level St. Louis Shag class with Stephen and Karine on Friday before the party. You can participate without a day workshop booking and you will then pay directly at the door. Balboa is known for its smooth, tight footwork with a lot of shuffling, and "chest to chest" close dancing position. It was born in the early 1930s, and was danced to Jazz and Swing music. It's origins are not clear. Balboa might have developed out of the Boxstep, the Charleston or the Single Time Shag, which all have a similar basic. It got it's name from Balboa Island, a half-island close to Newport Beach, south of Los Angeles. The Rendezvous Ballroom was the place to be for the best Balboa dancers. The basic is based on 8 counts. Balboa can be danced to any tempo from extremely slow to extremely fast. Because of it's tight footwork Balboa is popular to dance relaxed and elegently to fast music. The dancers always dressed sharply. Due to lack of space on the dance floor and to protect from kicks it was common that the dancers were not allowed to break away from the closed dance position. When the hot swing music really hit the scene some of the untaimed, younger dancers from the Los Angeles area enhanced Balboa with typical swing elements like break-aways, turns, and drops. This dance was simple called Swing. It was made popular by the "Ray Rand Swingers" of Southern California and dancers like Maxie Dorf and Lolly Wise. Some of the dancers danced only Balboa or only Swing, but many dancers switched between the two forms in one song and used the term Balboa as a synonym for both forms. To be more specific, they are referred to as "Pure Balboa" resp. "Pure Bal" and "Bal-Swing" nowadays. 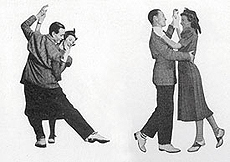 Shag is one of the classic three major Swing Dance forms (Shag, Lindy Hop, Balboa). 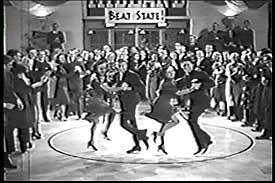 It even was spread all over America some years before Lindy Hop became popular. It consists of a lot of hops and kicks and is danced a lot in closed positions but has also open elements. It can be danced from medium to very fast music. Different styles were popular in different regions. The different forms of Shag are referred to as Single, Double, and Triple Shag. The different names describe how many slows will be danced. Single Shag has been a very dominate style in the Swing era. Nowadays the most common form of Shag is the Double Rhythm Shag. It’s based on 6 counts (like Boogie Woogie) and with a simple Slow, Slow, Quick, Quick this form of Shag is very easy to learn. Shag was the hottest dance among the college kids in the 30s, that’s why some styles were called "Collegiate Shag". Shag is not to be confused with Carolina Shag or St. Louis Shag.